The award-winning Sonicfire® Pro 6 software will speed up your post-production workflow like never before: No more music mixing, no more music cutting. 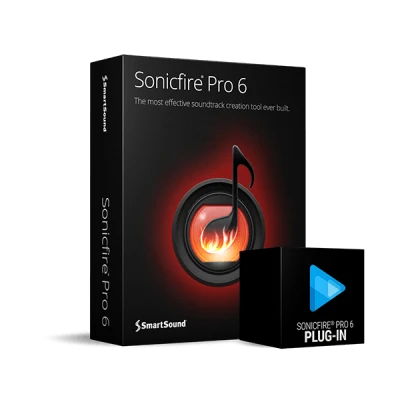 You choose the track and its desired length from the SmartSound® library - Sonicfire Pro 6 instantly creates your own custom version of the music track (including beginning, mid-section and ending) that perfectly fits your video's timing. Want a more detailed control over the music? Sonicfire® Pro 6 packs plenty of features to easily customize your track. Move individual beats while keeping the integrity of the music. Save hours of editing with the patented ability to customize the length of any music track. Create alternate arrangement options, instantly, and at any length. Experience Sonicfire® Pro's unique music search engine. When you purchase a track from SmartSound’s extensive music database, you only pay once and can use the track in as many projects as you like. Royalte-free music included with Sonicfire® Pro 6! 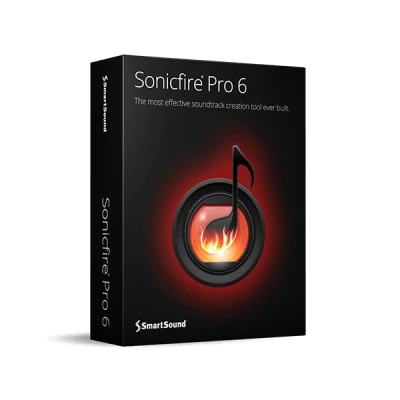 Core Ultimate is Sonicfire Pro 6's aptly named included album. Meticulously produced for the highest possible production value, it covers a wide array of styles, providing the media creator a rich and varied palette for almost any visual need. This incredible album includes a themed three-track orchestral suite ideal for scoring entire movies when used with Sonicfire Pro 6's powerful technologies. Inspirational tracks with a modernist edge, simple, happy, upbeat music, a rave rhythm-guitar jam perfect for high activity, a live vocal indie-rock song that could be a chart-topper, and more - there's 10 great tracks in total. Connect directly to the Sonicfire® Pro search interface with the length of your selection already set and instantly send your unique, customized soundtrack right into the VEGAS Pro or VEGAS Movie Studio timeline! Need to make a change? Use the same method to roundtrip the audio back to Sonicfire Pro to make your edits, then send it seamlessly back to overwrite the original. With Sonicfire Pro 6 and the VEGAS plugin, there’s no faster way to add a fully customized soundtrack to your video.